Deep Zazen at "Hidden Zendo"
Late Autumn, deep in the wooded region of New York, Sangha members gathered together from distant lands to honor the memory of Soyen Shaku Roshi with a five day Sesshin at the lovely “hidden” Zendo. 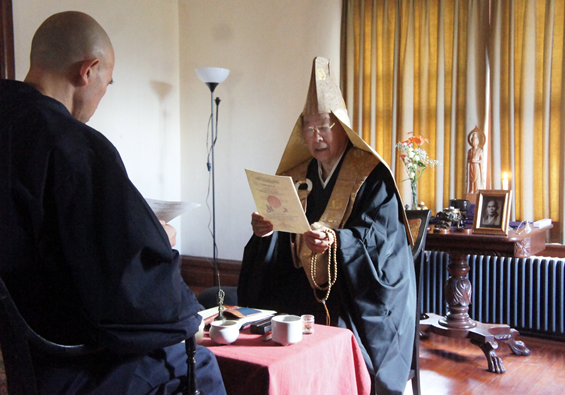 It was the second Sesshin this year organized by the Rinzai Zen Sangha with the guidance of its honored teacher and guest, Eido Shimano Roshi, to preside over this traditional Sesshin. 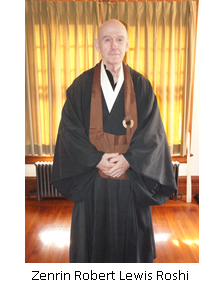 The Sangha attending was a wide variety of advanced students who have honored their Zen practice with Eido Roshi as their teacher for many years. Nothing could be better for them than to do Zazen in Sesshin with their beloved teacher Eido Roshi in a peaceful country setting in the middle of no where. We all came together with the sense of peace and harmony that only Dharma could provide. Seizan arrived from Switzerland to be the Tenzo as well as the Ino. Yugen arrived from Holland to lead the Sangha as Jikijitsu. Ekyo who was our Shika and Jisha, drove in with Daikyu from Rochester. Yushin, who was our Jokei, and Genryu both drove in separately from Washington DC. Zenrin traveled several days by car with Manny to bring the ceremonial instruments from his Florida Zendo. The rest of us converged from our homes in the Tri-state area, bringing all the needed food, supplies, cushions and instruments for Sesshin. The Rinzai Zen Sangha worked as a coordinated team so that everyone could arrive safely on time, ready to start. As Sesshin began, all of the Sangha became quickly aligned with the True Dharma that brought them all together. The Zazen was deep and the Sangha became ever more mindful of their presence to the Dharma as each day passed. Following afterwards, a special Jukai Ceremony was performed for Katsuo Takeda, as he was honored with the Dharma name Daikan or “Macro-Vista”. 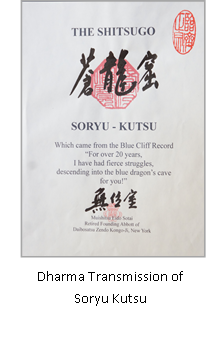 Each day, everyone had the rare opportunity to have their Dokusan with Eido Roshi a couple of time each day. It was a significant and powerful experience for everyone to bring out the true nature of peace and compassion inside us all. On the last day, everyone cleaned up every corner of the “hidden “Zendo without a trace and took with them their own personal experience of a lifetime to share with their friends and families at home, forever.